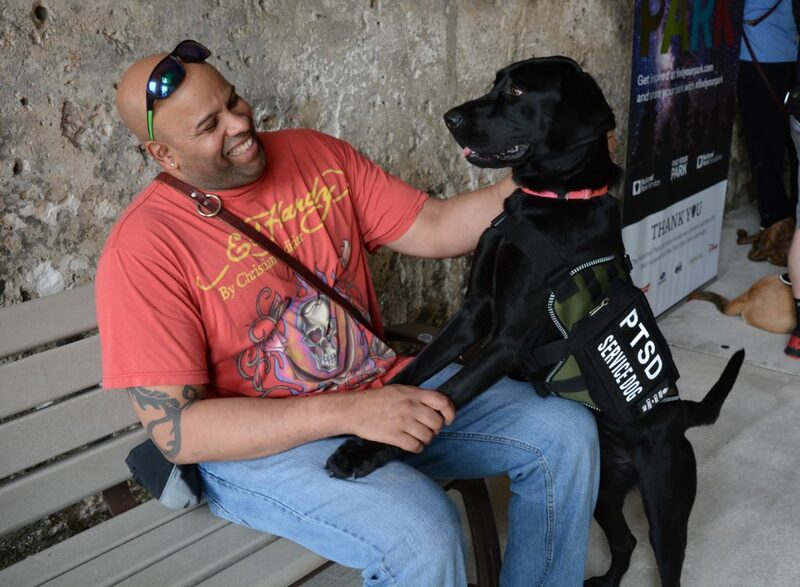 Retired U.S. Army veteran Carlos Cruz and his PTSD service dog Hanna. Post-traumatic stress disorder, or PTSD, does not discriminate. Factors outside one’s control can lead to this anxiety disorder, which affects millions of people — including some of the brave men and women who serve in our military armed forces. During their years of service, military personnel are at a greater risk of exposure to highly traumatic events that can have a long-term effect on their lives. As a result, panic attacks, insomnia, depression, and isolation are just some of the symptoms people with PTSD might experience, making it difficult for them to carry out activities that were once a part of their everyday lives. One of the methods some veterans are using to help alleviate PTSD is the use of service animals. Service dogs are trained to perform specific tasks for people with disabilities, as well as provide much needed support during stressful situations. 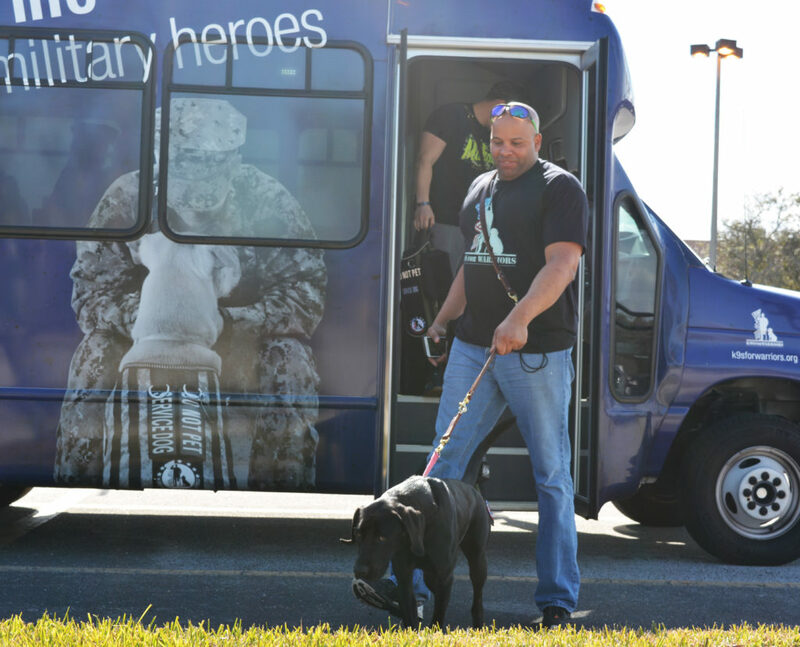 Thankfully, there are programs across the United States that are dedicated to helping veterans find a new lease on life by pairing them with a service dog that can provide emotional comfort. Carlos Cruz is a retired veteran of the U.S. Army and a recent graduate of K9s For Warriors — a program that provides service dogs to military veterans suffering from PTSD, traumatic brain injuries, and/or military sexual trauma. In just a short time, he has already begun to see the impact his service dog Hanna, a black Labrador Retriever, is having on him and his family since he completed the three-week, in-house recovery program this past January. “Before Hanna, when I would have to leave the house, my anxiety level was around a seven (out of 10),” says Cruz. “With her, now it’s at a four.” Wherever he goes, he takes Hanna, and together they are working toward letting Cruz regain control of what PTSD has taken away from him. With his service dog by his side, Cruz has pushed himself to go places he wouldn’t normally feel comfortable going, such as Disneyland and the movies, in order to spend quality time with his family. “There are times when I start to get anxious at the movies, and Hanna will jump in my lap and lay there, which helps with the nerves,” he says. Though going out to crowded places requires a lot of planning on the family’s part, compromises are made in order to make outings like these possible. “We can’t do the typical day at Disney, where you arrive early and stay all day, so we’ll go later in the afternoon when it’s less crowded,” says Cruz. That’s why programs like K9s For Warriors are extremely important; they’re set up to help people with PTSD find their comfort level and slowly return to civilian life. Cruz and Hanna on an outing with other K9s For Warriors participants. While serving in the Army, Cruz spent 11 out of his 20 years of service working as a military dog handler. After returning in 2013 from a yearlong tour in Afghanistan, where he worked as a bomb dog handler, he was diagnosed with PTSD. His previous work with canines was one of the reasons he wanted to partner with a service dog. “Because of my experience as a handler, I was comfortable working around dogs and that made it a bit easier when I started the program,” he says. The K9s For Warriors relations team and dog trainers on staff work in tandem to pair each veteran with a dog, based on a variety of factors. “The dog that matches the veteran the closest will become the warrior’s new battle buddy,” says Ehrhart. About 90% of the dogs come from shelters or are owner-surrendered. The rest are donated to the organization by breeders. 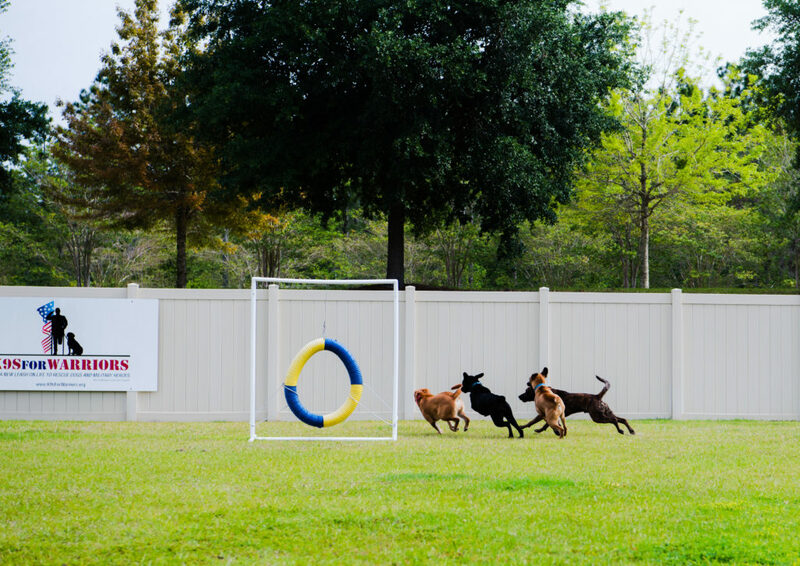 Service dogs play outside at “Camp K9,” the K9s For Warriors training facility in Ponte Vedra, Fla.
On the first day of training, Cruz met Hanna, and since then the two have been inseparable. Throughout the program, each vet and dog remain together at all times. Whether they’re training or out in the community enjoying an activity, program policy requires all dogs remain on-leash to encourage bonding. Hanna is very protective of Cruz and knows instinctively when her master needs her by his side. For example, when someone unfamiliar approaches, she automatically crosses in front of Cruz to create a bit of distance until he gives her the okay to relax alongside of him.